ThreatMetrix™ provides sophisticated user authentication solutions that leverage the collective power of a Global Trust Intelligence Network to deliver unmatched security and fraud prevention. Join this webinar for analysis of cybercrime & fraud attacks uncovered between April & June 2015. In Q2 the ThreatMetrix’s Digital Identity Network’s detected and stopped 75million payment attacks in real-time. The quarterly CyberCrime report compiles the key learnings and trends from this period to help businesses transacting online. Digital Identities have become the new perimeter in the fight against cybercriminals. Businesses need to come together to coordinate an effective defence and real time sharing of internet scale intelligence. * Explosive Cybercrime growth comes from criminals leveraging the internet – how can we use that same leverage to our advantage? * We can’t trust the endpoint and we can’t trust the user credentials – how do we operate in this new world? * How can real time sharing of anonymous Digital Identity behavior provide a new type of protection while offering improvements in end user experience? This holiday season is bringing an onslaught of fraud and cybercrime attacks to financial institutions, payment processors and online merchants alike. Sophisticated cybercriminal groups exploit increased traffic and transaction volume to launch new attack methodologies. Fraud prevention and security professionals can stay ahead by knowing the latest attack trends. 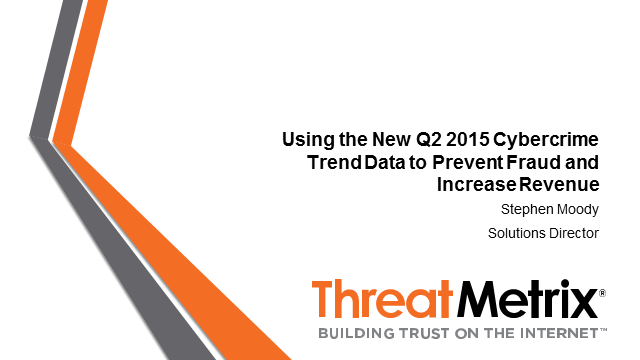 Attend this webinar for an analysis of findings from the ThreatMetrix Cybercrime Report. This front-line view of the global war against cybercrime is based on actual cybercrime attacks detected by the ThreatMetrix Global Trust Intelligence Network during real-time analysis and interdiction of attacks. This session will review data gathered from over 850 million monthly transactions, including findings from the recent Black Friday through Cyber Monday weekend. Attend our complimentary webinar, “Leveraging Cybercrime Intelligence Data to Stop Fraud”, to learn the latest methods being used by fraudsters and how you can stop attacks in real time – without impacting trusted customers. Does Fraud Prevention Turn Your Customers Off? Across the UK & Europe, Card Not Present (CNP) transactions are experiencing record high levels of fraud. In a recent study by TechValidate, 58% of companies that had deployed a Frictionless Authentication solution saw a 5-25% increase in business; with the cost of managing fraud and chargebacks had been reduced by up to 80%. Marc Lee will host a discussion around how frictionless authentication solutions can enable you to do more business online whilst cutting fraud and fraud management costs. Hear from Dennis Vogt, EMEA Evangelist and industry expert as he talks through insights from ThreatMetrix' Global Trust Intelligence Network and how they demonstrate that Mobile is increasingly becoming a new home for fraudsters especially related to New Account Creation and Payments. Traditional Password authentication has been compromised. Account Takeover is today the biggest issue facing Financial Services, eCommerce and Media companies. How can you tell when an Account has been compromised? In this 45 minute session Carmen Honacker will provide insights, strategies to help you get ahead of the fraudsters.